Bolton Wanderers were among the twelve teams that was a member of the English Football League from the start. They came in fifth place the first season (1888/1889) and in other words, it is a club with plenty of history. The club has never won the top leagues, but both FA Cup and the League Cup. Two of the most prominent players over the years are Joe Smith and Nat Lofthouse. 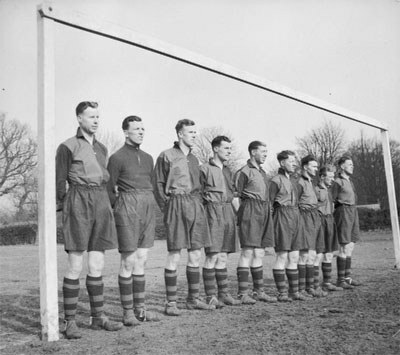 Men from Bolton Wanderers in 53rd Field Regiment during WWII. Bolton Wanderers FC was founded in 1874, and not to be confused by Wanderers FC, with pupils in Christ Church School on Blackburn Street. The second name “Wanderers” came from the fact that the club often changed head quarter. They reach the FA Cup final for the first time in the 1893-94 season, that time ended as runners-up. Almost twenty years later, in the 1922-23 edition they won the FA Cup for the first time.